Over the years I’ve accumulated resources that help me in my local businesses and those of my clients, and so I thought it would be helpful to share my personal list of resources here for your local business needs. This list will grow as I learn and use other resources and can recommend. I recommend bookmarking this page for your reference and convenience. Enjoy! Disclosure: Please note that some of the links below are affiliate links and I will earn a commission if you purchase through those links (at no extra cost to you). These are all things that I have experience with that I am recommending because they are helpful and are companies that I trust, and not because of the commissions that I may earn from you using these products. Please do not spend money unless you feel it’s for something you really need and will help you reach your goals. Getting Started Online for a Local Business: This is our free report for getting up and running on the Internet for a small and local business. Includes a 46-page report you can download with step-by-step instructions and a marketing guide with 20-modules. Get it here. Local Internet Marketing Presentation: This is my presentation to local businesses about using the Internet and online strategies to get more customers and increase profits. Get it here. Google Places: Google Places is where you go to get started on getting your business on the Internet. Make sure you have a website ready to go before you sign-up though. Google Places is also known as LBR and Maps – and it’s free here. Google Mobile: Yes, mobile is important and depending on your business and service it may be vital. Google Mobile is where your mobile journey should be begin and they’ll even help you create a mobile version of your website. More here. Online Reputation: This article 3 Essentials to Mastering Online Reputation for a Small Business at my blog goes through how you can monitor and track who is saying what about you so you can respond and preserve your reputation. Covers what to do if you get a poor review. GoDaddy: I use GoDaddy to register all my domains. I have tried other registrars but eventually moved them all to GoDaddy – and their prices and service are the best value I’ve found. However, I do not recommend you use them to host your site just to register your domain. Hostgator: I host 98% of my sites on Hostgator as I find them reliable and competitively priced and easy-to-use. This is another area I’ve tried a number of companies in the past and have got burned. Hostgator is one of the few companies where you to pay monthly as most others require you to pay a whole year up-front. Accept for one older site, all my other sites and client sites are now created as blogs. This is after years of using products like Dreamweaver and hand-coding HTML pages – yes, I’m a bit of a geek but not too much. Creating a blog is quick and simple and you can create a professional-looking traditional website in a fraction of the time and cost of using a heavy-duty web development tool. And so if you want to save money you can do-it-yourself. WordPress: The #1 Blog Publishing Platform. Free and easily customizable with great support. All of my blogs use WordPress. WordPress offer some free basic themes but you’re better off purchasing a professional looking theme for a business site. Solo Stream Premium Themes: My favorite resource for premium looking WordPress themes and a number of my own sites use themes from this company. All themes come with tutorials for setting-up. The Headway Theme: This is the WordPress theme and framework that I use to create client sites and it creates professional looking sites and is highly customizable and flexible. Be aware there is a learning curve to using this theme. 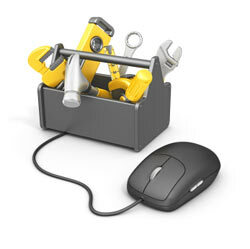 oDesk: Most business owners hand over design and creation of their website to specialists. Frankly, web designers and developers are easy-to-find but difficult to manage. Be prepared to spend time managing the project. We’ve had good success with this outsourcing website. Guru.com: Another outsourcing site I’ve had success with in the past for website design. NELM: While we rarely build websites any longer for clients so we can focus on website marketing, we do manage the creation and implementation of web sites for clients who also sign-up for our online marketing services. Click Bank: If you sell a digital product then Click bank should have your product to sell. Probably the most popular digital product reseller on Planet Earth. Decently priced, and comes with an amazing affiliate program for your products. Paypal.com: Paypal is ok for selling your own products or service and you’ll need an account anyways to configure with and accept payments from other shopping carts. We use it for incidental payment of services as its easy-to-implement and you don’t need a merchant account and the person purchasing doesn’t need a paypal account. But use it for small volume or a temporary solution as their fees are higher than other options – and that means less profit for you! Market Samurai: This software offers comprehensive coverage for any keyword research you may need to do and offers a lot of features and competitive information not found in free products. Google Adwords Tool: Google’s own keyword tool is free and a good tool to start with for research. Result information it returns is limited unless you have a Google Adwords account and then it’s a must to help you decide what keywords to use for your Adwords campaigns. WordTracker Free Keywords Tool: Provides another keyword research view for you over just Google-related data. Aweber: This service manages flawlessly our email lists and sending out email marketing and newsletter communications. It has high deliver rate of emails and protects you from spam complaints by requiring double opt-in mechanism for your lists. Google Analytics: Google’s free website tracking and analytical tool. A must have for anyone with any type of website. We require all clients to implement this on their site. Takes only a few minutes to setup if you use WordPress. Crazy Egg: Crazy Egg lets you track where people click on your pages and what are the most viewed parts of each page you track, so you can see the good, the bad, and the ugly about your design. 30-day free trial. NeedAnArticle.com: This website does a good job of finding article writers for you rather than navigating through freelancers that don’t specialize in writing articles but just want work. They also have people that will do eBook or white papers for you to offer as premiums at your website. oDesk: oDesk has a freelancer for just about anything you can imagine to do with your website marketing, including website design, video editing, graphics and copywriting. We have also found outsourcers for ghost writing eBooks as well as articles. Guru.com: When outsourcing I like to post the job to multiple sites to give myself an adequate selection of quotes to choose from. I nearly always post to Guru as well as oDesk and depending on the job my final choice is usually from one of those two. vWorker: Sometimes your job post just doesn’t get you any decent responses and so you need a third place – vWorker is our plan B and has an excellent escrow facility to protect you.